Gain an understanding of wildlife techniques and theory, including the basics of life history, identification, population and community ecology, habitat management, and animal behavior. Learn how institutional missions and federal laws influence wildlife and habitat conservation, and how humans affect and are affected by wildlife in rural, suburban, and urban environments of the Mid-Atlantic region. Pressing concerns about invasive species, the effects of climate change on wildlife, and the loss and degradation of habitats will also be discussed. Previous courses such as Biology for Naturalists (NATH1110E) and Intro. to Ecology (NATH1160E), or equivalent, are recommended. Field Trips: October 20, November 3, and November 17, 2018. If minimum student enrollment is not reached by one week before the scheduled start date, the course may be canceled. It is an internationally recognized celebration that helps the public gain a better understanding of, and appreciation for, the earth sciences. Organized by the American Geosciences Institute (AGI), this annual celebration has attracted young people since 1998. According to AGI, this theme will engage young people and others in exploring the relationship between the arts and Earth systems and promote public understanding and stewardship of the planet, especially in terms of the ways art relates to geoscience principles and issues as diverse as energy, climate change, the environment, natural disasters, technology, industry, agriculture, recreation, and the economy. Did we mention the Earth Science Week 2018 “Earth as Inspiration” toolkit? Order the 2018 Earth Science Week Toolkit – Earth as Inspiration! The democratization of science and technology represents a tremendous opportunity to empower communities to address issues of local concern and to expand scientific knowledge used in policymaking in both the environment and the health sectors. 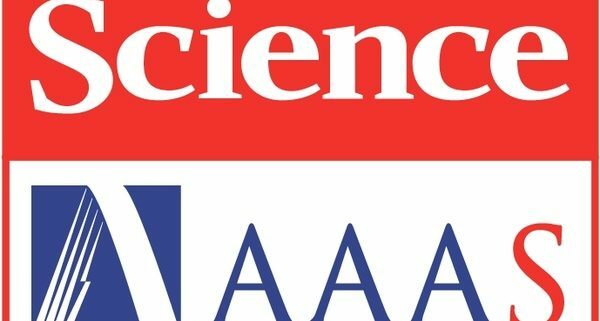 Citizen science presents a tangible opportunity for the general public to connect with research and science policy by creating opportunities for real, needs-based engagement. However, without intentional processes and design, it is possible to exacerbate existing inequalities. This symposium will address the intersection of two complementary approaches: community-driven research and citizen science. At its core, community-driven research involves the impacted community into research question and hypothesis generation. Once identified, the research questions may combine traditional and citizen science approaches in data collection and analysis. 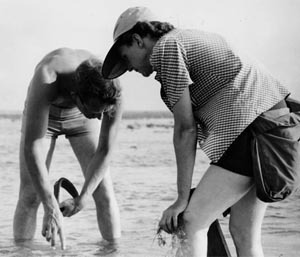 In contrast, many citizen science projects are conceived and initiated by scientists to answer research questions and leverage non-professionals as a means to crowdsource data collection and/or analysis. This symposium seeks to focus on questions and techniques developed outside of the traditional scientific community to engage communities in both participation and co-creation. This symposium will begin with a keynote address presenting a common understanding of community-driven research and citizen science. 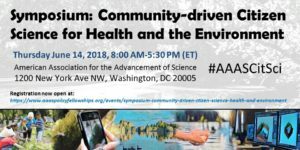 Related policies, projects, issues, and strategies will then be addressed in a series of three panels that focus on different aspects of community-driven citizen science. Panelists will reflect viewpoints across the citizen science spectrum: from funders, to researchers, to members of impacted communities. The panelists will address policy considerations and contributions, broadening participation of underrepresented groups, project design and implementation, and outcomes. Additionally, an expo for local community-driven citizen science projects will highlight local projects and organizations. Lightning talks by the exhibiting groups, sharing their interests in and/or experience with community-driven projects, will provide conversation-starters to facilitate networking. At the end of the day, the goal is for attendees to gain a better understanding of the potential research, public engagement, and policy applications of community-driven citizen science and to advance their involvement with a broader network of interested communities. Follow the discussion on Twitter with #AAASCitSci and #BDHubs! 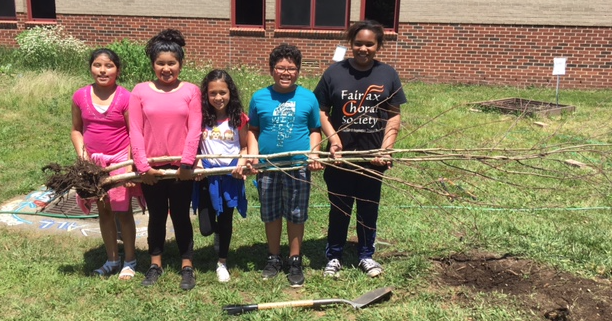 This is Fairfax County’s official Earth Day and Arbor Day event! Visit with the Fairfax County Park Authority, workshops, vendors and activities and take action to make a “Healthy Planet-Healthy People.” Over 75 vendors, exhibitors, and food trucks will be at SpringFest. Admission is FREE! Learn about the great work of Fairfax County Parks; pet an alpaca; run through an environmental obstacle course; participate in environmental crafts; check out the bees and the trees; consult with Fairfax Master Naturalists and Master Gardeners; buy plants for your garden and MORE! Entertainment includes food trucks, The Recycling Pirates puppet show, petting zoo, Touch-a-Truck, and more! Clean Fairfax produces SpringFest with our partner Fairfax County Park Authority. Learn more here. Dr. Robert K. Musil discusses his book Rachel Carson and Her Sisters: Extraordinary Women Who Have Shaped America’s Environment and his explorations of nature throughout the nation’s capital, which resulted in his latest book, Washington in Spring: A Nature Journal for a Changing Climate. Musil followed in the footsteps of nature writers and explorers from Captain John Smith through John Burroughs, Elliott Coues, Louis Halle and Rachel Carson — carefully noting the gradual shift in phenology and species with the progression of global warming in greater Washington. Musil will also sign copies of his books available for sale immediately after his talk. Dr. Musil is President and CEO of the Rachel Carson Council, Inc. and former Executive Director and CEO, Physicians for Social Responsibility, 1985 Nobel Peace Prize organization. Brought to you by the Virginia Native Plant Society, Potowmack Chapter. Learn more. Let’s suppose that you are a master naturalist charged with setting up classes in ecology, biology, evolution, and genetics. A clever person, you are opting for flipped classes so that participants can do the fact-based parts of the learning beforehand, while you use class time for hands-on collaboration. Where do you go for high-quality content? Crash Course at your service. The Green brothers, both polymaths, have built a repository of user-friendly lessons on YouTube. Their hilarious 10- to 15-minute bursts are scientifically sound, relevant to what naturalists do, and lots easier to absorb than a long book or classroom lecture. The Ecology playlist, for example, features Hank’s 12 lessons on the history of life, population ecology, human population growth, predators, succession, ecosystem ecology, hydrologic and carbon cycles, nitrogen and phosphorous cycles, pollution, conservation and restoration—solid stuff, but designed for easy digestion. Biology offers 40 lessons. Among them, “That’s Why Carbon is a Tramp,” “Animal Development: We’re Just Tubes,” and “Fungi: Death Becomes Them” remind you that humor is an awesome learning lubricant when what needs to go down are bits of covalent bonds and mycorrhizae. Are these snacks the same as a full-length college course? Of course not, but for concepts, conversation, and test prep, they are delicious and filling.